Imagine projecting a huge image using millions of tiny, little mirrors. That’s exactly how DLP® projectors work. The advantage of using so many mirrors is simple. More mirrors. More pixels. The more pixels, the sharper the image. What is a DLP projector? 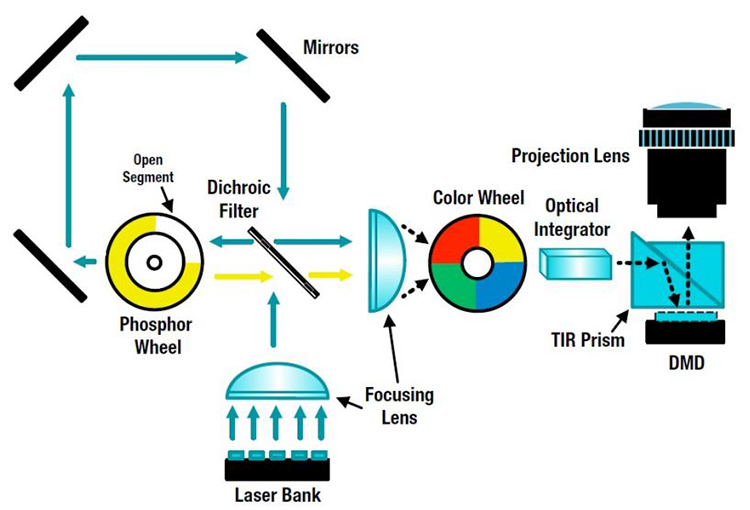 DLP stands for “Digital Light Processing.” DLP projectors beam light through a color wheel, reflection mirrors, then finally a lens. Developed by Texas Instruments®, the DLP chip, aka digital micromirror device (DMD), differentiates DLP from LCD projectors. Each mirror on a DLP chip is about the size of a red blood cell. These mirrors (magnified above) manipulate light to create an image. The mirrors must change position on a microscopic suspension hinge at incredible speeds. Up to 16 million cycles per second. Each mirror creates an image in response to video source data. In the “On” position, the mirror reflects light toward the screen, creating a visible pixel. In the “Off” position, mirrors reflect light away from the projection lens. This prevents light from traveling onto the screen. Most DLP projectors use a color wheel. 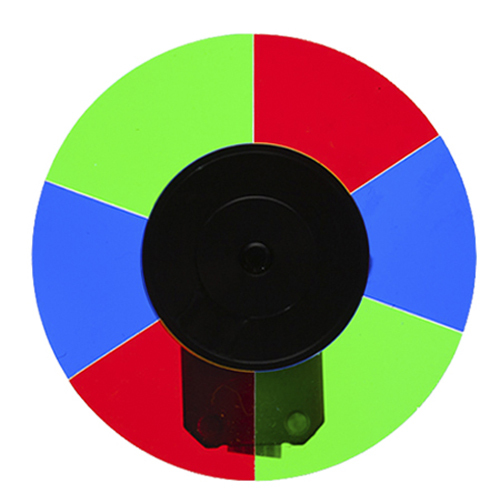 The color wheel spins RGB patterns in front of the light source at high speeds. DLP projectors use this color technology to deliver cinema-like quality. The beauty of DLP technology is based on a deep understanding of the human eye. Every 1/50th of a second, the retina combines the amount of red, blue and green light it sees to produce an image. A DLP projector very quickly shines red light, then blue light, then green light. It happens so fast, the human eye thinks it's seeing a distinct image. What's really happening is that you're seeing pulsating shades of RGB light. The alternating pattern happens so quickly, your brain puts together a complete image. If time was slowed, you would not see the full image. Instead, there would just be sequential images of red, green, then blue light! 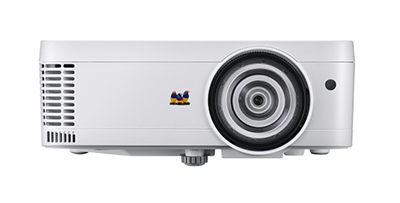 DLP projectors come in a dizzying array of features and price points. Different combinations suit different applications. Uses range from home entertainment to houses of worship. Portable presentations to lecture halls. Conference rooms to collaborative classrooms. By knowing how you’re going to use a projector, you’ll be able to find the projector that’s right for you. Think back to the amazing mirror-laden DLP chip. Each mirror creates one pixel. The total number of mirrors corresponds to the screen resolution. For example, a 2K DLP projector has about 2.2 million mirrors. A 4K device about 8.8 million. The greater the resolution, the better the image quality. 4K DLP projection is set to explode. 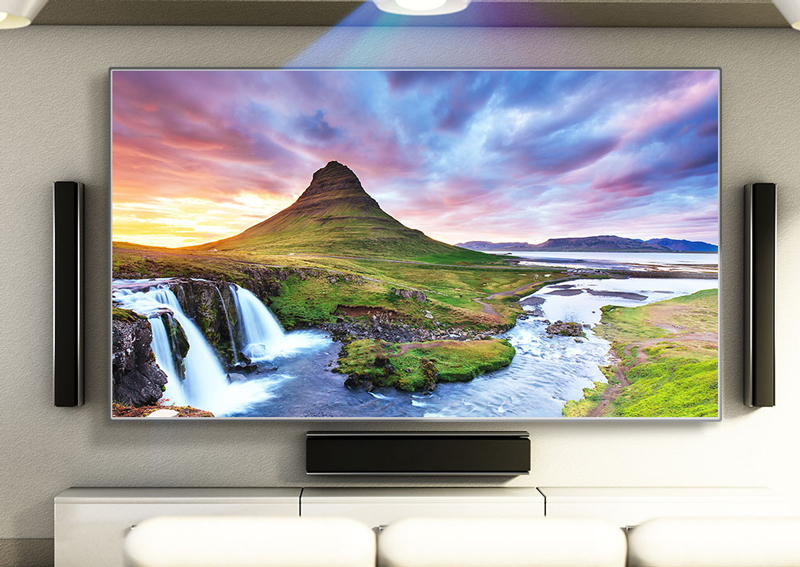 Ideal for home theater, 4K projectors are engineered with advanced DLP® 4K Ultra HD chip and XPR technology. 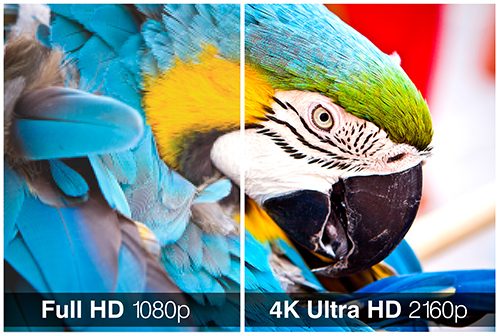 In turn, they deliver 8.3 million distinct pixels in 4K UHD (3840 x 2160) resolution. When comparing 4K projectors some may say they “support” 4K. This is not the same as the ability to reproduce actual 4K images. DLP projectors must produce the minimum 8 million active pixels required by the Consumer Technology Association (CTA) to qualify as true UHD projection. 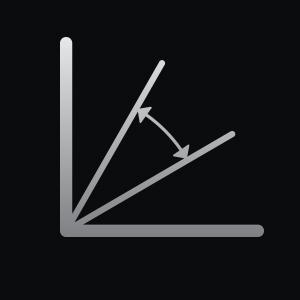 Contrast ratio compares the darkest and lightest values a projector can produce. The higher the contrast ratio, the better the picture quality. DLP projector contrast ratios range from 500:1 to 100,000:1. Contrast ratio is an important spec for home theater projectors and high-end use. For home theater applications, look for a contrast ratio in the range of 10,000:1 to 100,000:1. Bigger is better. For large venues, like auditoriums, go for the best: 100,000:1. A high contrast ratio is less critical in classrooms and conference rooms, as the benefits are most noticeable in highly light-controlled, pitch-black rooms. For business and classrooms, look for contrast ratios in the range of 4,000:1 – 30,000:1. Projector brightness is measured by how much light the projector can output, called lumens. The more lumens, the brighter the projector. Importantly, brighter isn’t always better. Environments don’t always need the brightest projector to achieve satisfying results. Higher brightness also means higher cost. Ambient Lighting. Viewing spaces with lots of lighting require higher brightness to deliver a sharp, clear image. In darkened rooms, like a home theater, lower brightness (but higher contrast ratios) deliver great results. Multi-purpose spaces do well with mid-range brightness, from 2,000 - 4,000 lumens. Room/Screen Size. Larger rooms and screen sizes require brighter images. The higher distribution of light over an area, the brighter you’ll need a projector to be. The number of people in a room is a helpful guideline for determining comfortable viewing. Generally, the more people in the room, the larger the ideal screen size. • Under 3,000 lumens – Used in low-lighting environments, these projectors require tightly controlled lighting to eliminate ambient light. Ideal use: home theater. • 3,000 – 4,000 lumens – This covers the sweet spot of DLP projectors, in terms of value and features. These are the typical brightness levels used in classrooms, conference rooms and home entertainment rooms where you’re unable to block out ambient light. • 4,000+ lumens – Projectors with this level of brightness are appropriate for the largest meeting rooms, classrooms or multipurpose rooms. DLP projectors in this range produce a crisp, clear image, even on larger screens. This enables ease of viewing with larger audience sizes. Ratings higher than 4,000+ lumens are considered high brightness projectors and are used in high-end commercial installations. Select DLP projectors have added features. These enhancing characteristics build upon key specs noted above. Knowing about these features will determine the DLP projector that’s best for you. Home theater enthusiasts are among those who seek the ultimate in color performance. Cinematic color projectors offer outstanding home theater experiences by combining the following features to deliver a stunning, cinematic experience. Rec. 709 is a stringent international high definition standard for the reproduction of color. Certification with Rec. 709 ensures accurate reproduction of the precise colors of the original content. Rec. 709 projectors deliver movie-theater-quality color accuracy. Standard DLP projectors use 3-segment color wheels. 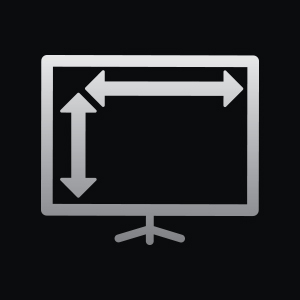 4-part color wheels add a white segment (to increase brightness). 6-segment color wheels deliver a wider color range. 6x Speed RGBRGB Color Wheel projectors boost red, blue, and green hue and saturation. The result: vivid images with smoother color gradients. The Imaging Science Foundation (ISF) certifies projectors for color reproduction and fidelity. ISF-certified projectors have day and night modes that deliver optimized color in both bright and dark environments. If needed, ISF-certified technicians can provide on-site tuning for customized image calibration. The main benefit of choosing a projector over a TV comes from the ability to create a much larger screen image. Look for quality of life features that help you adjust that image to perfection. Lens shift enables DLP projectors to adjust projected images without having to physically move the projector. Images can be shifted for horizontal and/or vertical adjustment. Projectors with vertical lens shift deliver added flexibility for challenging professional installations. For home users, lens shift enables easier optimization of image placement. Keystone correction, or “keystoning,” is a handy way to adjust projected images. It’s a great tool for on-the-go presenters and portable entertainment projection. Look for horizontal and vertical (HV) keystoning and 4-corner adjustment features to eliminate crooked and distorted images. Doing so creates perfectly proportioned pictures. 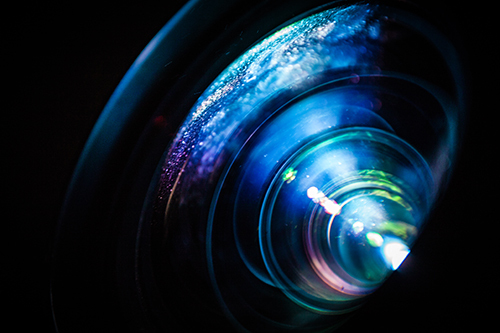 Optical zoom enlarges projected images by extending the DLP projector’s lens. This lets users magnify images without moving the projector. Optical zoom allows for placement further from the screen without reducing image quality. The wider the optical zoom, the greater the degree of mounting flexibility. The optical zoom offered on a professional laser projector delivers outstanding ease of installation. When exhibit designers can install DLP projectors in virtually any position, creativity expands exponentially. Laser projectors for large venues are an ideal example. Mount it pointing straight down at the floor. At any angle from floor to ceiling. It can even be mounted upside-down at a 45-degree angle. Need portrait positioning? No problem. 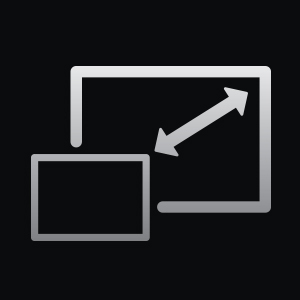 Designed for specific needs, special features will help you make the most of your projector. 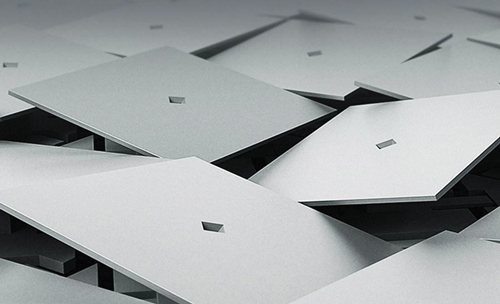 Wireless solutions add flexibility, mobility and ease. Hidden compartments house secure HDMI ports to enable multimedia content streaming. A wireless gateway lets users present directly from their USB drive, or stream directly from their phone or tablet. Measured in milliseconds, DLP projector input latency is the time between video signal arrival at a projector and display on the screen. It’s also called lag. Lag is inevitable with any digital video processing. Gameplay can be significantly disrupted. Fortunately, it can be minimized. 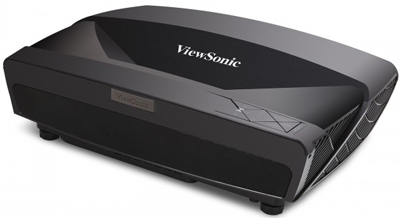 Gaming projectors feature reduced input latency. Laser projectors look best when paired with an ambient light screen. This is done to reduce any effects of ambient light, and to take full advantage of the incredible images projected by DLP laser technology. Pairing laser projectors with diffuser screens enhance contrast and eliminate washed out images in ambient light. If you're going to use a projector outdoors, there are many large screens available. Watch what the Linus Tech Tips team decided to do, after mounting a DLP projector to their car. 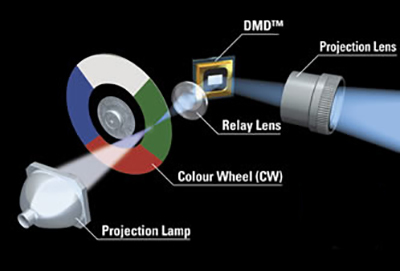 DLP projectors are classified by light source and imaging technology. The most expensive use 3-chip processors. One chip for each primary color: red, green and blue. The newest single-chip DLP projectors offer high-end DLP projection with a less costly price tag. DLP projectors now use lasers or LEDs to be more efficient, environmentally friendly and longer lasting. These newer technologies eliminate the need for a spinning color wheel. Most DLP projectors use traditional lamps. The biggest advantage of lamps is cost, which is lower than any other option. Lamps typically last 3,000-4,000 hours with standard use, then need to be replaced. Some manufacturers offer special features to make lamps last longer. 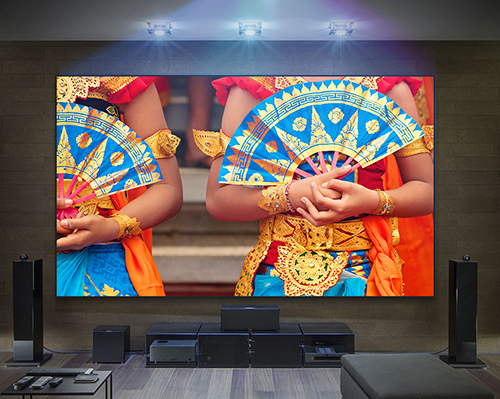 Lamp-based DLP projectors deliver outstanding value while creating big, bold images. They’re popular for home theater and gaming. The brightness of DLP projectors typically range from 2,000 to 5,000 lumens, creating a cinema-like experience in darkened rooms. Lamp-based projectors provide supersized movies and games, for an immersive, theater-like experience. 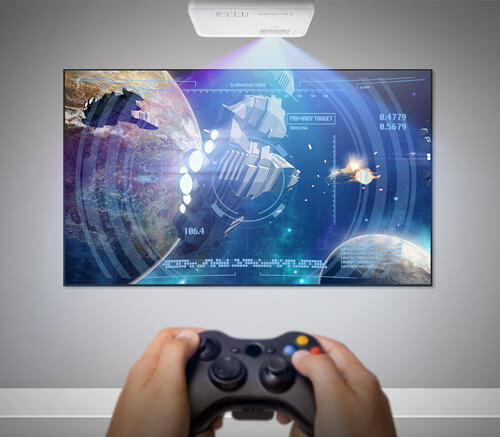 For gaming, look for DLP projectors with low input latency. Gaming projectors specialize in reduced input latency, delivering gaming intensity with smooth, delay-free images. At the higher end of the cost continuum, laser-based DLP projectors offer many advantages. Laser light encapsulates the need to be both very bright and consistently bright. At all times. (Projection lamps slowly dim across their lifespan). Brighter than other options, laser projectors can be counted on to deliver vibrant and visible images. Even in well-lit spaces. This makes them wildly popular in conference rooms, classrooms, auditoriums and houses of worship. Because of their lengthy lifespan, between 20,000-30,000 hours, they’re a great choice for high-end ceiling-mount applications. Laser DLP projectors deliver instant on/off capability and minimal maintenance. They’re even energy efficient and mercury-free for eco-friendly disposal. Laser projectors are packed with features for big screen, big venue applications. 5,000 lumens blaze brightly through ambient light in large boardrooms, conference halls, and auditoriums. Numerous high-end features ease install and management. For education environments, short-throw laser projectors feature long life, low maintenance and great TCO. Like a sealed optical engine and waveform air filter. Horizontal/vertical keystoning. Network management capabilities. Laser DLP projectors should deliver 20,000 to 30,000 hours of maintenance-free use for a low total cost of ownership (TCO). Presentation projectors are ideal for business environments. Look for a higher lumens count if you’re going to be using a projector in well-lit areas. Also look for ultra-short throw ratios, HV keystoning and 4-corner adjustment features. If you’ve gone wireless, examine features that facilitate wireless streaming. These DLP projectors use LEDs (light-emitting diodes) to produce light. LEDs are like tiny light bulbs. But they’re powered by an electrical circuit and illuminated by a flow of electrons. Because there’s no filament, LEDs last much longer than traditional projector lamps. They stay cooler, don’t need a fan and use much less electricity. LED projectors start up in an instant, for wait-free viewing. LED technology is also mercury-free. LEDs can be designed into much smaller projectors. This makes them great as portable projectors. 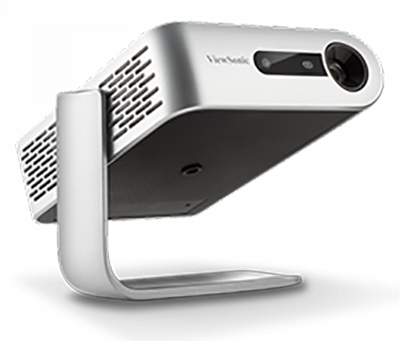 Ultra-portable projectors are great examples of what LEDs can do. The advanced, solid-state LED light source can last for over 30,000 hours of eco-friendly, mercury-free use. It consumes less than half the power of a typical LCD TV. Modern designs make it easy to relocate them to any venue. Due to enhanced design quality, DLP projectors encompass more value than ever before. 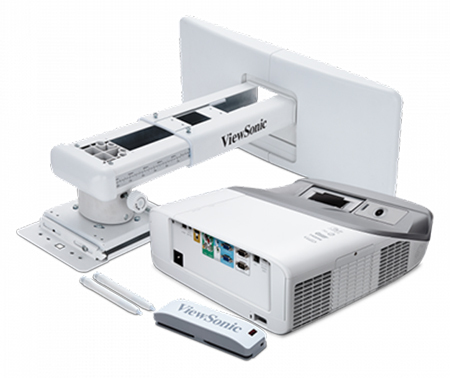 Specialty projectors fit a wide range of use cases to fit your needs. Many DLP projector applications benefit from features that offer easier management and maintenance. Networkable projector solutions reduce the time and cost burden of managing multiple projectors across multiple locations. Connected to a wireless or wired local area network, these DLP projectors can be used across any sized installation. Then remotely operated and monitored. This centralized control adds efficiency, reduces costs and lowers overall TCO. With all projectors, images get bigger the further they are from the screen. The space needed between projector and screen to create the same size image, however, is variable. This distance, called “throw ratio,” depends on the projector’s lens. Check out this projector distance tool to further understand how projector distance works: https://www.viewsonic.com/us/distance-calculator. Imagine an 80” projection screen. Most projectors will need to be at least 7-8 feet from the screen. Short throw projectors only need 3-3.5 feet. Ultra-short throw projectors can be placed even closer, 2-2.5 feet from the screen. If you’re short on space, short throw is the way to go. Short throw and ultra-short throw DLP projectors make it easy to create big, stunning images in small spaces. They eliminate the long streams of light and shadow created by projectors placed further away from the screen. Short-throw projectors have ratios between 0.6-0.8. Ultra-short throw ratios are anything <0.5. 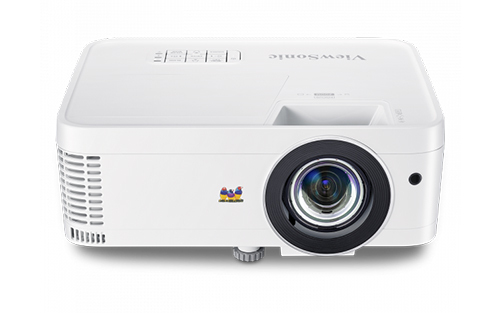 Interactive projectors like the PS750HD are one of the fastest growing display categories. Interactive technology improves collaboration in both classroom and business meetings. The interactive whiteboard module transforms short-throw projectors into interactive projection solutions. Advanced laser curtain technology provides intuitive multi-touch capability for up to 10 users. Annotation software enables users to simultaneously write and draw on projected images, including documents and web pages. 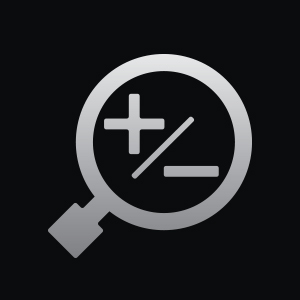 Once you've found the type of projector that's right for you, optimize your image with the Projector Distance Calculator here. Monitor Curvature: All the Info You Need About Curved Monitors!